THIS WORKSHOP IS FOR Pediatric CANCER PATIENTS AND FAMILIES Only. If you are a social worker or anyone from a care team, and you would like to refer a patient or a family to any of our workshops, please do reach out to our Executive Director, Suzanne Yau, at suzanne@kidsandart.org. In 2008, Kids & Art Foundation was hosted at Pixar Studios for its very first workshop. In 2018, our 10th Anniversary year, we are super excited to return to Pixar for another exciting, art-filled workshop! Thank you Pixar Studios for beliving in our mission to heal pedaitric cancer through art. Thank you to all of the hosts, over the past 10 years, who have supported us! 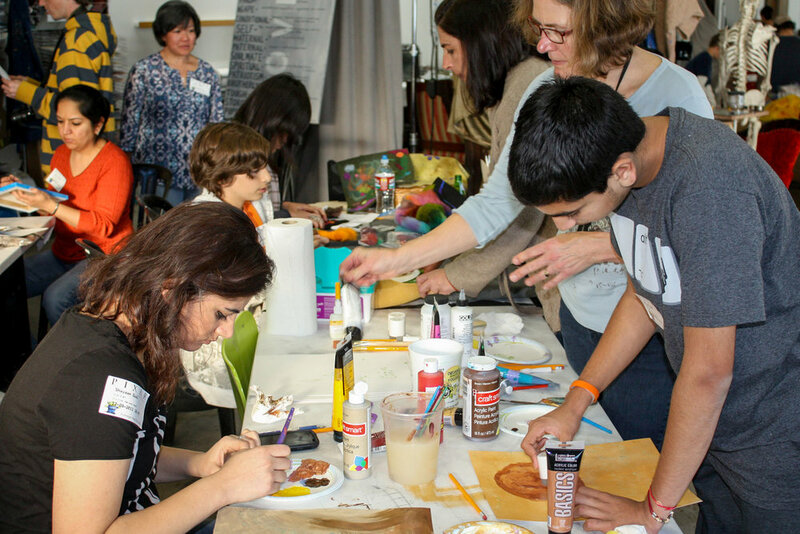 Kids & Art participants are getting ready for another unforgetable experience at Pixar. The kids/AYA are being paired with artists to create art inspired by the theme "Be Incredible". The professionals, practicing Bay Area artists, will be working alongside youth artists to create lasting memories and "Incredible" art. Our professional artists will be encouraged to create a piece inspired by the kids/AYA art. Artwork by both the professional and youth artists will then be displayed side-by-side at a Kids & Art exhibit at a later date. The workshop will be held in the art room, in the building behind the main Pixar campus on Hollis Street. Directions will be sent to registered attendees. All registered attendees will have to abide by strict Pixar campus rules. Our workshops are free to all pediatric cancer families. To participate as a family, artist, or volunteer, please click on the button below. MESSAGE FOR ARTISTS: Thank you for volunteering with us for this workshop. This is a wonderful opportunity for our kids to create with you on a more individual level. You can bring in a simple or complicated project. You will be paired with 2-3 kids to create art together. Feel free to bring in some of your work to show the child/teen, or just talk about the project you have designed. In the past, we have done printmaking, coffee stain art, acrylic painting, mixed media, clay, and quilting, just to name a few. For this particular workshop, we are asking our artists to be inspired by the children and to create a piece of art based on their experience of creating together. We will be hosting a special art show where the artist and the child/teen pieces will be paired together for exhibition. MESSAGE FOR VOLUNTEERS: You will help with set up and clean up. You will assist all the artists and clean brushes or change water or work with a younger child if they need help. We will guide you. This workshop is brought to us thanks to the generous donations from our facebook fundraiser. We still need to raise $350 by August 15. Thank you for your generous donation: Kanjana Amato, Ranju Reddy, Pamela Hornik, Anuradha Sharma, Jade Kwan, Patty Owyang, Toby Cochran, Lisa Kinne, Laxmi Natarajan, Renata Tabellion, Maryam Sadeghy, Kiran Chadha, Parveen Dhillon, Bill Shen, Swetha Pakala, David Clark, Britt Kopping, Radhika Vullikanti, Ashween Sahni, Jay Ng, Jeremie, Gluckman Picard, and Mara Grimes.